This week we are looking for SPANISH MACKEREL photos. 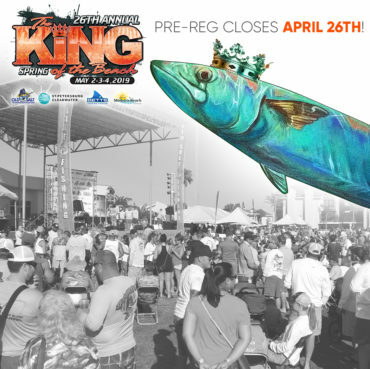 This is an add on species to the 25th Anniversary Spring King of the Beach. The prize this week is a official King of the Beach Performance T-shirt and a VIP package which includes drink tickets, raffle tickets and more. Valued over $75. So send us your pics by April 9th to win. This is an excellent game fish that can be taken on a wide variety of lures and baits. Nylon jigs are considered on of the best lures, especially when retrieved rapidly with an occasional jerk of the rod tip to impact a darting motion to the jig. Feather lures and spoons are also successful, while minnows and live shrimp are the best natural baits. Occasionally almost any lure or bait will work, while at other times, nothing will.